stevetravisuk – Steve Travis – President P.A.L. I am thrilled that PAL will be involved with Paws for Thought in aid of Wilderness Foundations Forever Wild Lion Conservation initiative. World famous South African artist and PAL Founder, Conor McCreedy as donated one of his iconic lion paintings for auction and the proceeds will go directly for the Wilderness Foundation. Curated by the One&Only Cape Town, the fundraiser evening features a gourmet menu presented by chef Reuben Riffel and paired with fine wines from the Kleine Zalze estate. 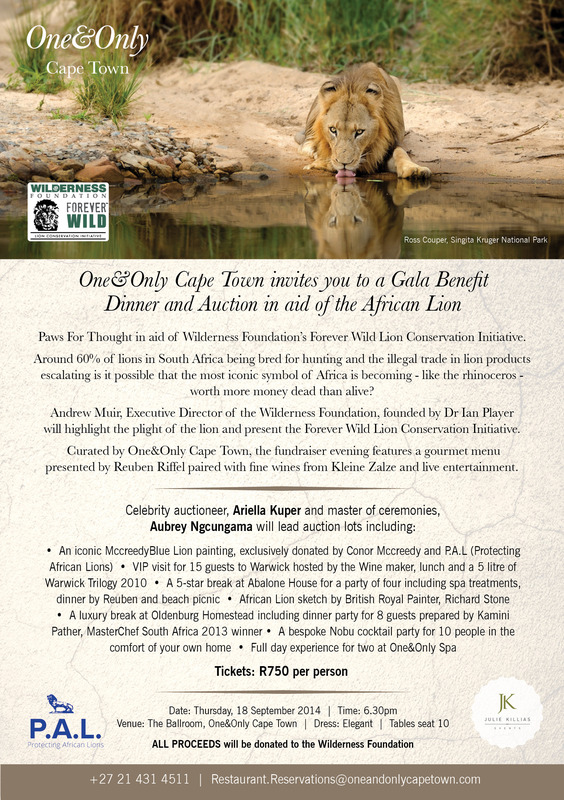 What a fantastic way to help protect our last lions through art, quality cuisine and entertainment. Khimbini Hlongwane from Inyati Game Reserve in the Sabi Sand was captivated by animals from an early age. Hlongwane says he battled when he grew older and had to divide his days between going to school and spending time having fun outdoors. Three Amazing Lion Related Events in One Day! I had three wonderful events on my birthday yesterday! This is an extreme passion of mine and I know with the entire team all coming together we will make a difference, we will prevail and we will protect our lions. 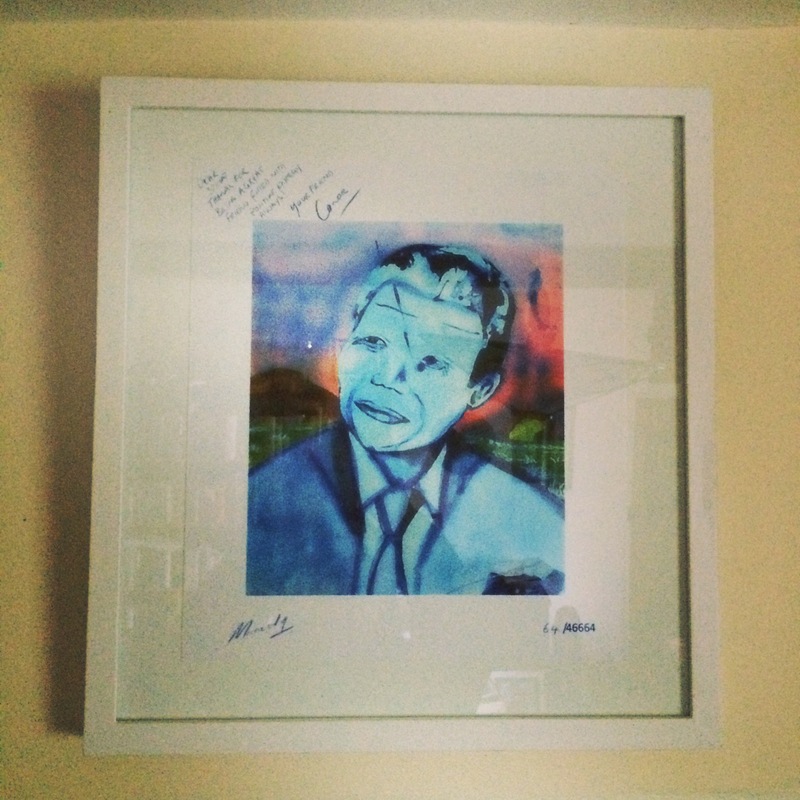 The second great thing to happen yesterday was that my McCreedyMandela limited edition print arrived. It now sits pride of place in my lounge. You really should get one, they are fantastic and support a wonderful cause. ‘Canned hunting’ is the practice of shooting captive-bred lions in enclosed spaces for sport. Parts of lion carcasses are then retained as ‘trophies’ and, in many cases, brought back to EU Member States by their owners. Would the Commission consider introducing legislation to ban the import of such ‘trophies’ into the European Union? 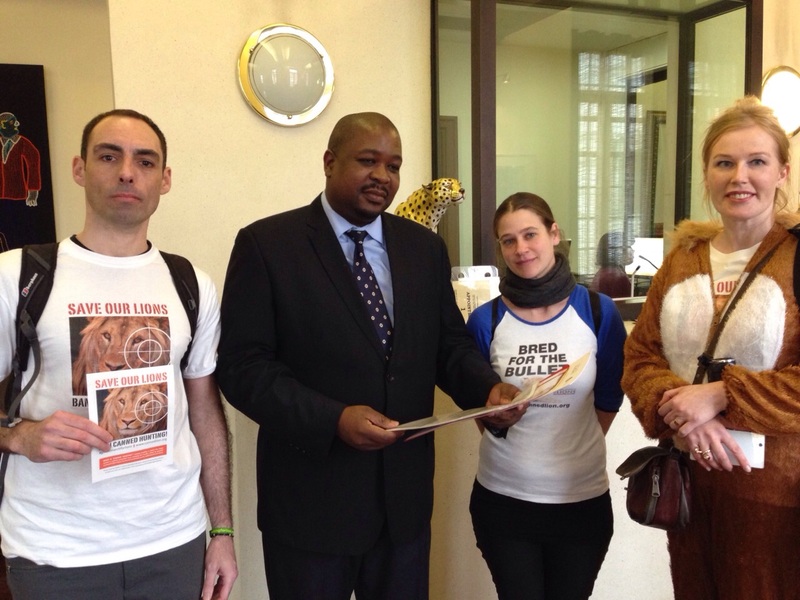 Such a ban would create a disincentive for the continuation of this abhorrent practice and is consistent with European Parliament resolution of 15 January 2014 on wildlife crime (2013/2747(RSP)), which called for a possible revision of the EU’s legal provisions governing the import of hunting trophies into Member States. “People are sick of seeing animals treated badly. It´s gratuitous to cause unnecessary suffering and upsetting, especially to children. Keith is deeply committed to protecting the rights of animals and promoting higher standards of animal welfare across the EU, and has made this a top priority in his work as an MEP. He is a member of the European Parliament Intergroup on the Welfare and Conservation of Animals. Animal welfare can be a difficult area to work on at EU level as, apart from farm animals and movement of animals between Member States, most animal welfare related issues fall under nation state competency, meaning that the EU has limited influence. This means that whilst laboratory animals or farm animals are subject to EU minimum welfare standards, stray animals, companion animals, animals in circuses or animals used in ‘sport’ are not. I am very pleased with this development and hope you will follow the links above to stay in touch with the situation and follow its progress. Have you seen my photo series “I shoot animals with a camera not a rifle”? All on twitter @stevetravisuk. More to follow soon, thanks for all your support. 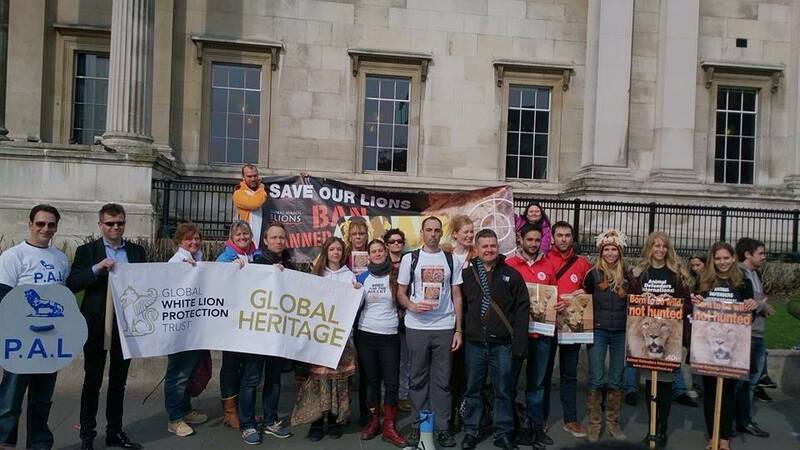 It’s T minus 3 days since the Global March for Lions. I have finally found the time to sit and share my thoughts and emotions about a day that was probably one of the best days of my life. The world united and gave birth to a movement of change. What started with a single persons passion for the protection of lions, to ban canned lion hunting, became an event that transcended borders, countries and continents. The birth of the passion captured around the globe, the birth of a unified call for action, the birth of international relationships and friendships, the birth of bonds of a common goal. Circa 70 thousand people, 66 cities, 22 countries, 1 cause. Ban Canned Hunting. Throughout my work life I have always had an ethos that essentially says, “Do worthwhile work”. Whatever we do in our lives, there should always be a reason and we should always do it to the best of our ability, make a difference and learn along the way. On Saturday 15th March 2014, our planet united to do worthwhile work. I am a mere drop in an ocean of humanity that flooded the world with support, passion, love and a determination to have their voices heard. There are so many people who fight this battle every minute of every day of their lives. They work tirelessly to make a difference. They are true heroes to humanity, they restore my faith, they inspire, they call, we answer, we act. It’s the small way we collectively help make a difference. Human spirit aside, social media played the biggest role in this entire event. 15 years ago we would have used 50 forests of trees in fax paper and letters around the world to communicate. It would have taken us 10 years to sufficiently get the message out there to have had an equal response of participants. By that time, Lions would have been extinct already. In todays world, this was achieved in 5 months. This has given us a 9.5 year head start in saving the worlds lions. I have done so many wonderful things in my life, experienced the best and the worst of man, lived chapter after chapter in my book of life that hold the most incredible memories, lessons, loves, losses, passion, understanding, compassion, joy and serenity. However, the raw emotion, the naked love for the planets wildlife were exposed to a level I have not witnessed before last Saturday. For me, this was one of the most humbling experiences of my life. My learning for the day was that by not protecting the head of the food chain will effectively alter the entire ecosystem and balance of nature in the wild. Lose the lion and suddenly the single biggest threat (besides man) to all other wildlife has been removed. Their instincts will change as they grow accustomed to not having to be on their guard 24/7, complacency will set in, behavioural patterns will change. These, and thousands of other points, will upset the balance of nature to a point beyond repair. 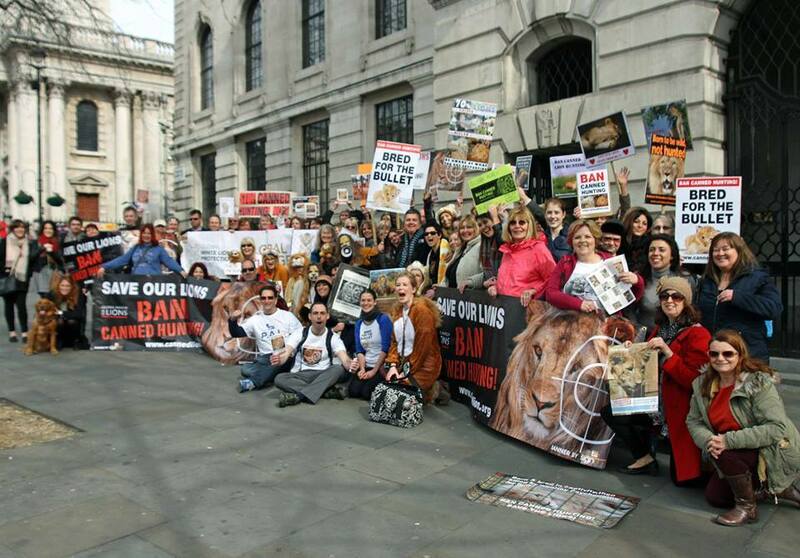 I bow to the efforts, the direction, the passion shown by so many involved in the organisation of the Global March for Lions. I have the utmost respect and admiration for everyone who gave so freely and willingly of their time, their money, their hearts to this cause. 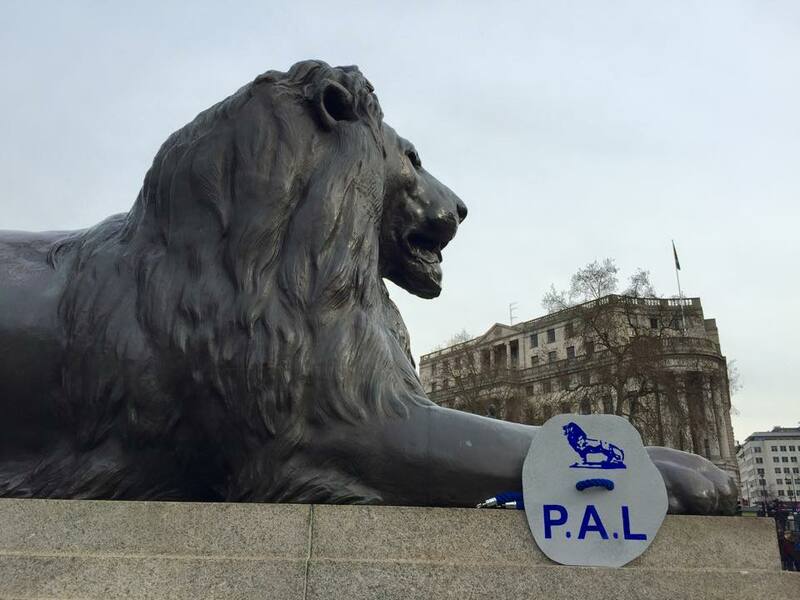 As Dr Pieter Kat (Lion Aid) said in his speech in Trafalgar Square, “This is the first step”. Yes Pieter, following the birth of this movement we took a GLOBAL step. I can only imagine what power we will have when we have learnt to walk. I posed a question on Saturday to a few fellow Global Quest Warriors (my new name for all those who joined in the march and online tweet storms). We have had Live Aid, we have had Water Aid, Comic Relief, Sports Relief, and relief effort after effort around the world. My Global Quest Warriors, I put it to you, it is now time for a Wildlife Quest. There are many doing fantastic work for individual species world wide, well how about we put our species centric focus aside and unite for all Wildlife? Unite Lions, Rhino, Tiger, Orca, Dolphins, Wolves, Badgers, Shrews, Elephant, Pandas, Leopards, Jaguars, Panthers, Birds, Bees and every other threatened species on the planet. I just thought I’d put it out there. Anyone want to join me on a mission to make this happen? 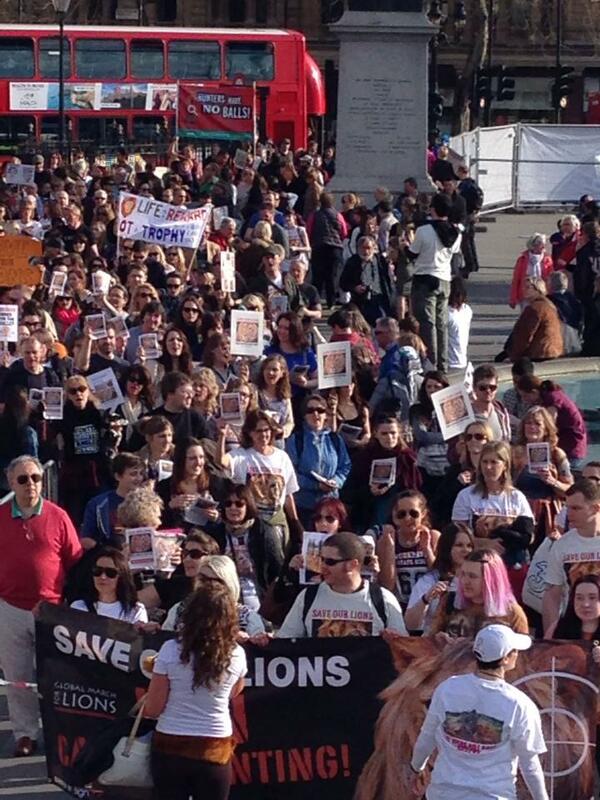 Have a look at the Global March for Lions Facebook pages and Twitter feeds to see hundreds of photos of this incredible world wide event. Thank you for this wonderful piece. As a Global Ambassador for Protecting African Lions your and everybody’s support on the Global March for lions is appreciated and valued. Thank you. Rosemary Wright has graciously allowed me to share this blog post from her wonderful animal advocacy blog A Beating Heart. Over 40 cities around the world are marching on March 15th to raise awareness and to advocate on the issue of ‘canned lion hunting’. This is a heinous practice in which lions are bred in captivity and then sold to trophy hunters to be killed in captivity. These animals are often tame and drugged. 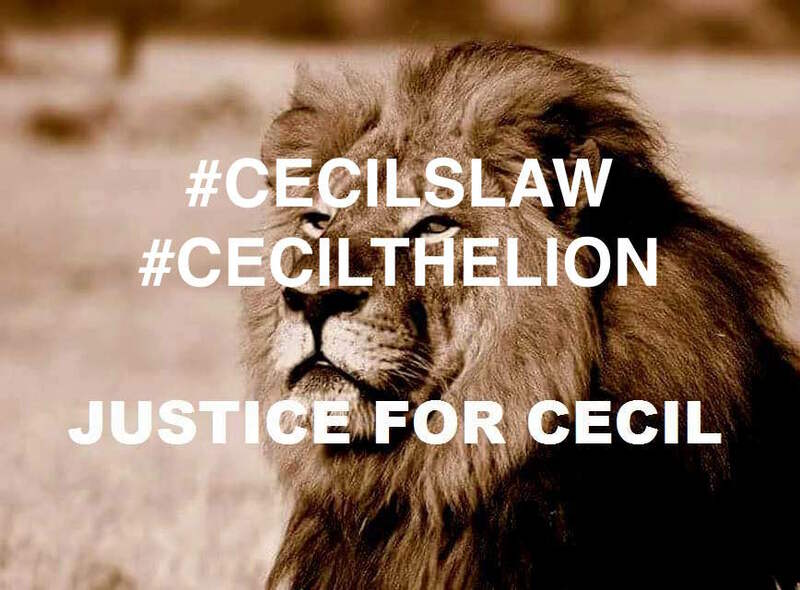 This practice is undermining the few remaining wild lions that are left. This industry is supported by tourists. A big thanks to Rosemary for her dedicated advocacy of the world’s beautiful critters. 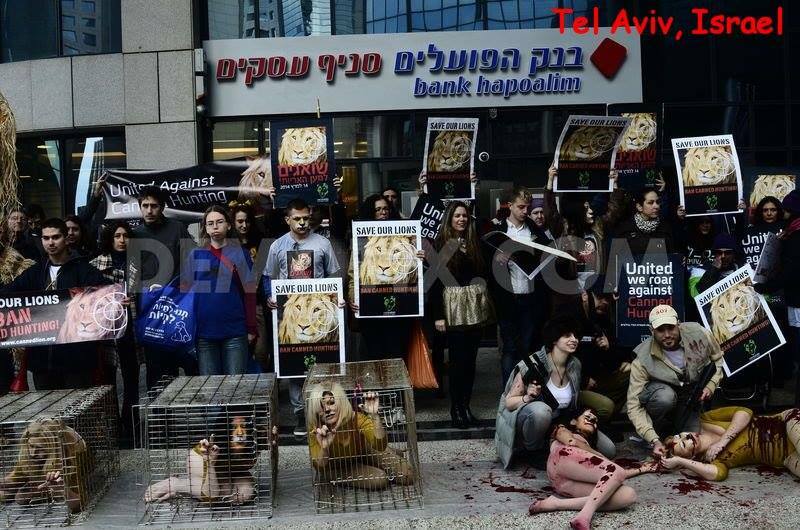 Why Participate In The International March For Lions?